Figure 1.Human autonomic nervous system (from Gray's Anatomy) showing sympathetic nerve fibers (red) and parasympathetic nerve fibers (blue).. Figure 2. The sympathetic system prepares the body for fight or flight. It can limited the blood supply to the digestive organs, increasing the amount of blood available for muscles and limbs. The parasympathetic system conserves resources and relaxes the body after an emergency or for sleep. 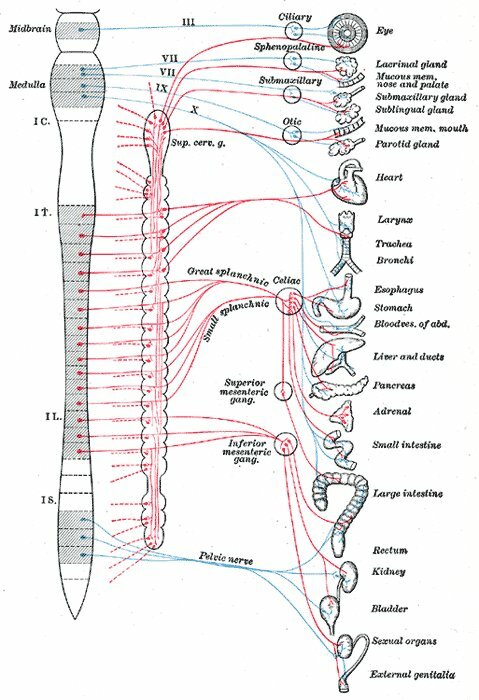 Sympathetic nerves (red lines) lead from the spinal cord to nearby nerve chains, the sympathetic chains of ganglia, The parasympathetic nerves (blue lines) lead directly to the organs. This system also controls the heartbeat. Figure 3. The path of sympathetic fibers out of the spinal cord. The autonomic nervous system (ANS) is the part of the nervous system that supplies stimulation to the involuntary muscles, such as the smooth muscles and cardiac muscles, and to the glands. The ANS is controlled principally by parts of the brain stem and the hypothalamus. The system of nerves spreading through the body is referred to as the peripheral nervous system. The outer or somatic part links up the sense organs, which provide the individual with a picture of the outside world, and with the effectors that enable movement. But in order that these sense organs and effectors function, the inner machinery of the body must be functioning smoothly and the rate at which it works must be adjustable so that the varying demands of the outer structures may be satisfied. When a person is moving, his or her muscles require a greater supply of oxygen than when at rest. The heart must beat faster to supply more blood and this blood must be supplied with sufficient nutrients and oxygen, the lungs must be filled with air and emptied more frequently, the blood vessels to the muscles must be expanded and more channels opened up there to cope with the increased supply of blood. The nerves that coordinate the inner workings (e.g., smooth muscle of the gut and blood vessels, and the glands) form the visceral part of the peripheral nervous system. The visceral motor nerves are usually called the autonomic nervous system although they are controlled by the central nervous system just as the somatic motor system is. The autonomic nervous system is often referred to as the involuntary nervous system since we have very little conscious control of its activities, but with training it is possible to change the size of the pupil of one's eye or to alter the speed of one's heartbeat. The cell bodies of somatic motor nerve cells are inside the spinal cord, but a characteristic of the visceral motor system is that the cell bodies of the final motor nerve cells (those that are in contact with the organ that they supply) are outside the spinal cord. These cell bodies are grouped together to form ganglia that lie either close to the spinal cord along nerves or actually in contact with the organs they supply. Thus, whereas the axon of a somatic motor neuron is long and carries impulses out from the spinal cord to the structure concerned, the typical visceral motor nerve is composed of two parts. One runs from the spinal cord to a ganglion and is called a preganglionic neuron; the other links with the preganglionic neuron in the ganglion and passes to the organ that it supplies. It is called a postganglionic neuron. In mammals the preganglionic neurons usually have a fatty myelin sheath (i.e., they are myelinated), but the postganglionic neurons have no sheath and are said to be unmyelinated. The autonomic nervous system may be divided into two parts, the sympathetic nervous system and the parasympathetic nervous system. Generally their actions are opposite and their positions in relation to the spinal cord are different. Sympathetic nerves arise from the spinal cord between the neck and waist region. Parasympathetic nerves arise from the head and from the sacral region (between the waist and tail). 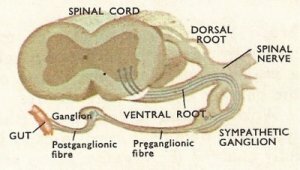 Sympathetic preganglionic fibers leave the nerve cord by ventral roots as do somatic motor nerves, but parasympathetic fibers leave by both dorsal and ventral roots. Each preganglionic fiber is connected with many postganglionic fibers. 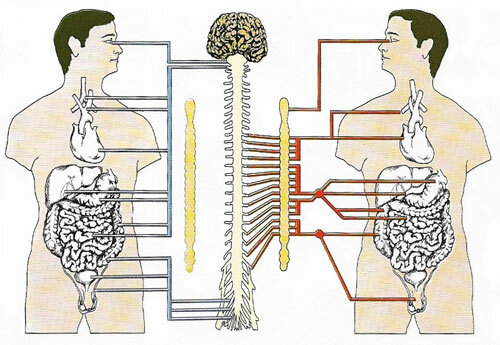 Though the two parts of the autonomic system arise in different parts of the spinal cord, their branches spread nearly everywhere within the body. Most organs receive both sympathetic and parasympathetic neurons, though some (e.g., sweat glands) receive only one (in this case the sympathetic). The gut, for example (apart from the sphincter muscles), relaxes when it receives signals through sympathetic neurons. Signals through parasympathetic fibers cause it to contract. The sphincter muscles are affected in the opposite way, contracting on the receipt of impulses from the sympathetic and relaxing on receipt of signals from the parasympathetic. On the other hand the actions of the two systems may not be strictly opposite. The salivary glands produce a thick slime (mucus) when stimulated by the sympathetic system, but they produce the more watery saliva when stimulated through parasympathetic fibers. The action of one system on different parts of an organ system may vary considerably. Signals from sympathetic nerves increase the strength and rate of the heartbeat, but the main arteries leaving the heart relax, so allowing an increased flow of blood. Sympathetic nerves usually cause the the musculature of the rest of the blood system to constrict. During digestion the blood flow to the gut is increased by the gut blood vessels relaxing. At the same time the blood supply to the muscles is reduced to allow for this. The actions of the autonomic nervous system are many and varied (see table below). Experiments indicate that the sympathetic part is concerned with preparing the animal for violent action and for withstanding abnormal conditions. The parasympathetic system is more concerned with re-establishing normal conditions in the animal once it has been involved in strenuous actions, so that it is ready once more to expend large amounts of energy if necessary. Parasympathetic nerves initiate peristalsis and stimulate the production of digestive juices by the associated glands. Parasympathetic fibers also supply the heart, lowering the frequency and strength of the heartbeat.